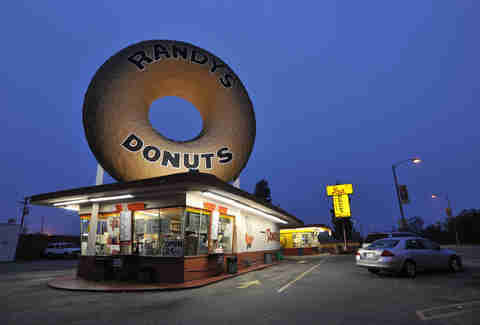 LA has a reputation as a healthy-food paradise, but c'mon people: if you live here, you know that's not totally true, because HAVE YOU SEEN HOW MANY DONUT SHOPS WE HAVE? 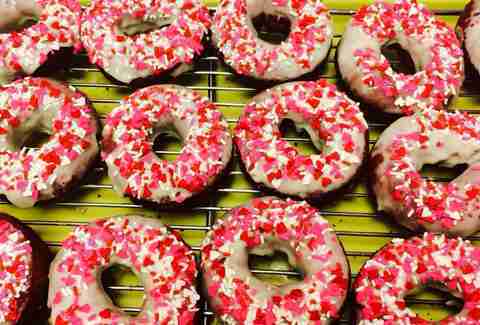 And we're not just talking old-school favorites, either; every year brings more specialty pastry-makers to town, which is why we've updated this list of the best donut shops in LA. 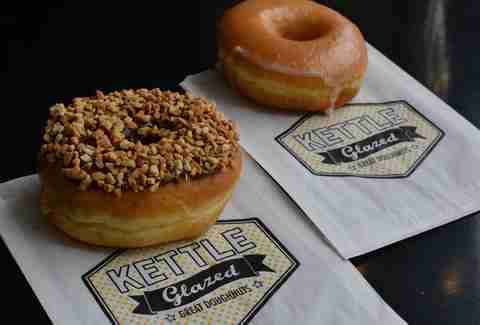 There are now multiple locations of this Portland import in the city, and it’s no wonder: their brioche-based options include interesting flavor combos like a raspberry and rosemary old-fashioned and a chocolate salted almond stunner. Teresa Ngo Chahinian and her family run this old-school strip mall donut shop, which’s pretty much the last thing worth stopping for before climbing into the Santa Monica Mountains. 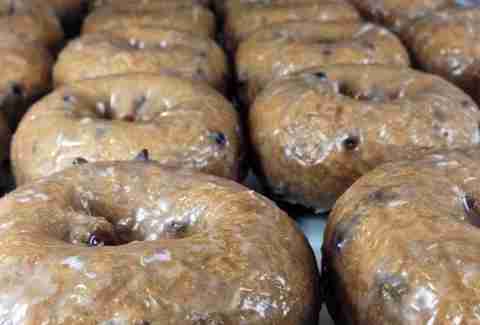 It absolutely kills it with classics, including a crusty Blueberry Old Fashioned and raised donuts that are magically chewy. Its deluxe Black & White donut is the go-to though -- it’s a black and white cookie, but in donut form, with both chocolate and vanilla glazes. Yeahuh. Surprise! 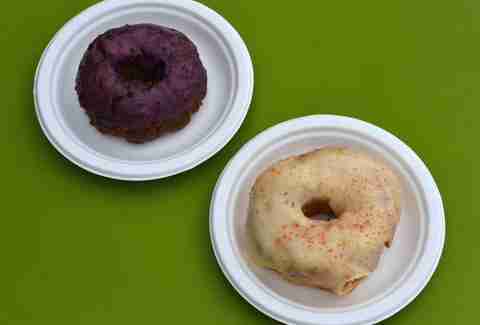 You can now get Cofax’s devastatingly good breakfast burritos with also-devastatingly good donuts since this tiny coffee shop (named after Dodger legend Sandy Koufax) hired a next-level pastry chef, who’s making raised and cake donuts in fun flavors like Honey Sea Salt, Lemon Pistachio, and Spiced Crumb. Get the Honey Sea Salt if you want the best donut, but get Nicole Rucker’s Compartes Chocolate Chocolate donut if you want the most Instagrammable one: it has a dark chocolate cake base and photogenic rainbow sprinkles. In a totally bizarre, post-rock-star move, Drive Like Jehu drummer Mark Trombino (who also produced those Blink-182 albums that soundtracked your teen years) set up this Pinkberry-esque donut shop in Highland Park, where you can choose from music-themed "favorite compilations" like the Husker Blu cake donut (w/ fresh blueberries and blueberry glaze), or the Yo La Mango, a raised donut with sweet mango glaze, chile lime seasoning, and spicy finish. Did we mention you can actually donut DIY here, with dozens of available sauces, sugars, spices, toppings, creams, butters, fresh fruits, and cheeses? BECAUSE YOU CAN. 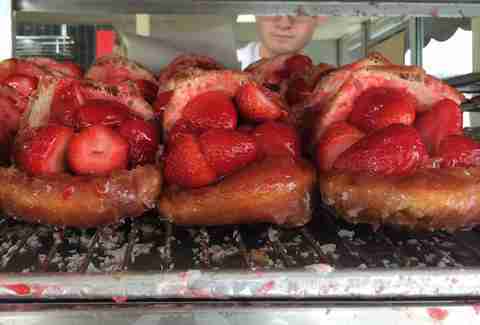 Each year, people patiently wait in line for Donut Man’s ultra-fresh, fruit-filled donuts, which -- depending on the season -- could see whole strawberries or peach chunks spill out of a sliced, hole-free glazed donut. Oh, and even when these fruit flavors aren’t available, The Donut Man is still worth visiting -- its crullers are especially good, as are the Tiger Tails, which are raised, glazed twists with cinnamon stripes. 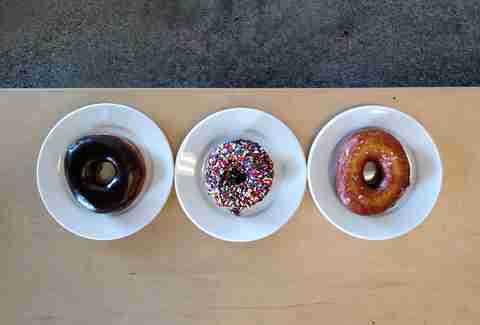 Donut Snob makes some of the best donuts in LA -- and doesn’t even have a storefront. 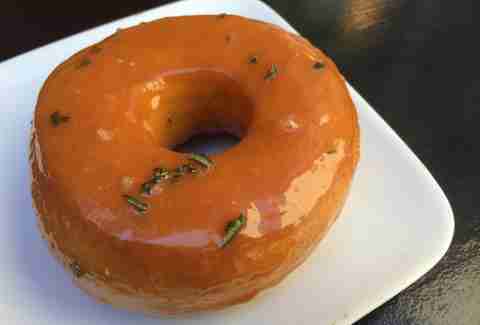 Instead, you’ve got to seek its raised rings at area coffeehouses (Taza is a reliable supplier in Arcadia, and Donut Snob’s website has a page that runs down where else they’re available). The Campfire donut is a fun play on S’mores, with chocolate ganache, Graham cracker crumbs, and toasted marshmallow, and it also crafts creative seasonal flavors like Blueberry Earl Grey and Cherry Hibiscus. 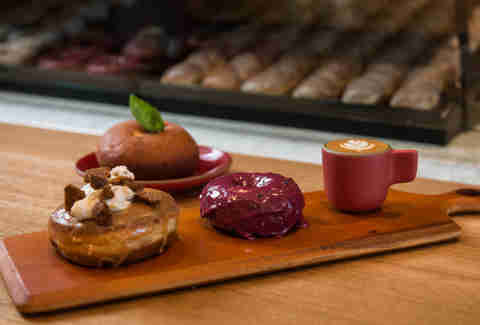 This tiny space right next to BLD busts out donuts in both “simple” and “fancy” categories, which are frankly kind of deceiving: there’s nothing simple about Buttermilk Brown Butter or Salt & Pepper Caramel donuts, both raised, with nice chew. 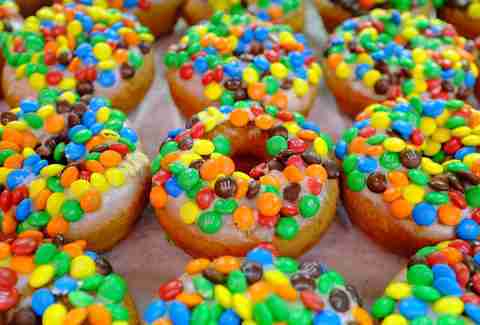 Those fancy donuts, tho? Rocky Road, and Peanut Butter Cookies & Cream. Bingo. This neo-retro donut shop may turn out on-trend variations like Cronuts and Cruffins, but the truth is, the best thing it does is much more classically inspired, including a glazed vanilla bean, glazed chocolate with crushed peanuts, and lemon squares with lemon curd filling and powdered sugar stenciled in a checkerboard pattern. If a pastry ends up on the counter at this industrial-chic café, there’s a strong chance it will be great. Its Coconut Brown Sugar is pretty tremendous, featuring vanilla-flecked brown butter glaze topped with coconut strands both raw and toasted, but its Rosemary Caramel is a savory take that’s also clearly worth sticky fingers. 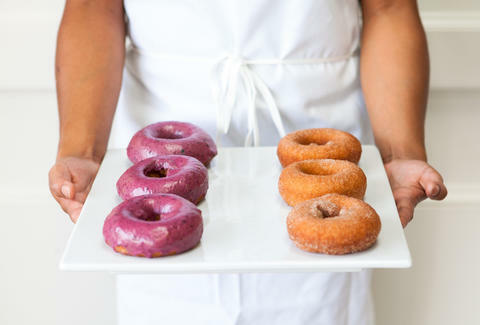 This Santa Monica strip-mall mainstay is on top of its donut-trend game: their cronuts -- excuse us, kronuts -- are legendary, and the waffle donuts they serve take the best of both worlds and make them, uh, even better by deep-frying a waffle (made from a combo of waffle and donut batter) before giving it an array of donut treatments, like sprinkles or a glaze. 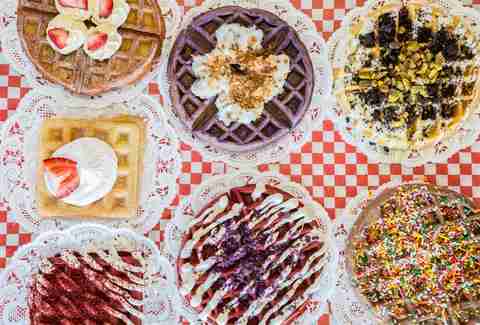 Curing the hunger-pangs of many, many late-night LA sweet freaks is this 24-hour no-frills shop, which has been run by the same family for multiple generations. The move is to just ask for what’s fresh: they’re always cooking something up so there will be something warm about to come out of the oven. Just cross your fingers it’s the apple fritter. 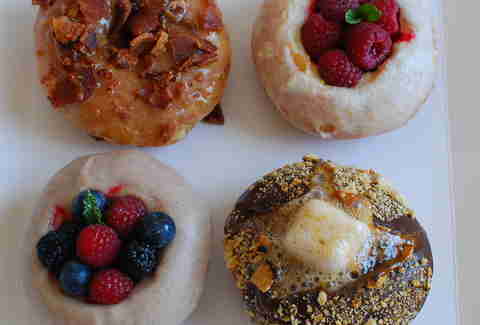 The new kid to the block may actually be making the best donuts in the city: their Costa Mesa store’s been beloved for years, and when we ate at the SaMo location right after it opened we were floored by their pastries, which are made fresh every hour and have a perfect crustiness that hides an exceptionally moist interior. They’re superlative. Getting a donut at Bob’s is like hanging out with an old friend you forgot you loved hanging out with: the old-school front at the Farmer’s Market is the definition of tradition, and its drip coffee compliments classics donuts with perfect glazes and topped with just the right amount of sprinkles. And their cinnamon rolls? Legendary. Look, you’re gonna want a photo with their iconic, massive-donut sign, but then you should eat one of their buttermilk donuts, which will make you realize the truth: THEY ARE SO MUCH MORE THAN THIS MASSIVE DONUT SIGN. This sandwich shop with the striped awning is just around the corner from always-kooky Venice Beach, which is mayhem in summer, but worth braving not just for its superlative sandwiches (Mr. Electric FTW! 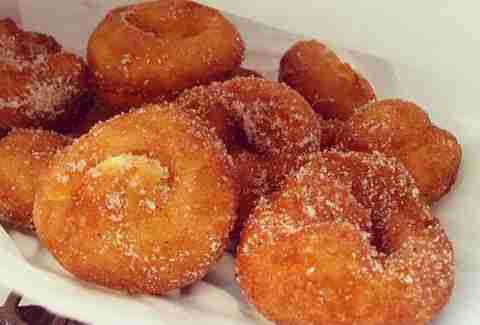 ), but also its mini donuts, which are fried to order and dusted with cinnamon sugar. 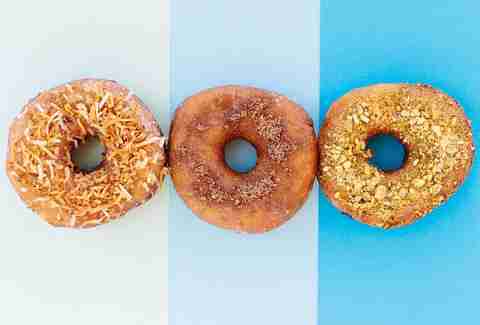 Basically, they’re kind of like churros in donut form. Churronuts? Joshua Lurie is the LA based founder of Food GPS, a website that showcases the best tasting food and drink in California. Follow him on Instagram and Twitter. If there's sprinkles on it, that's what Jeff Miller's ordering. You can find him at @jeffmillerla on Instagram or @thrillistla on Twitter.